I love olives in just about any form, and these garlic olives couldn’t be simpler. Even though I’ve posted this before, I thought it would be fun to showcase this recipe again. It always happens like this, we are expecting a great deal of company at different points in time. When this happens, I like to make as many things as I can ahead of time. Doing make-ahead recipes allows time to enjoy our guests and not be tied to the kitchen. 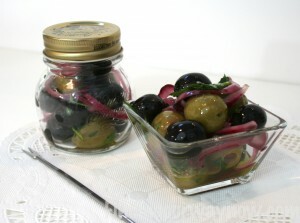 To do that, I go to some of my tried and true recipes, such as these simple garlic olives. Place all the ingredients in a lidded glass jar. Place the lid tightly on the jar and shake. Refrigerate for at least 2 hours. They can be kept refrigerated for up to a month. 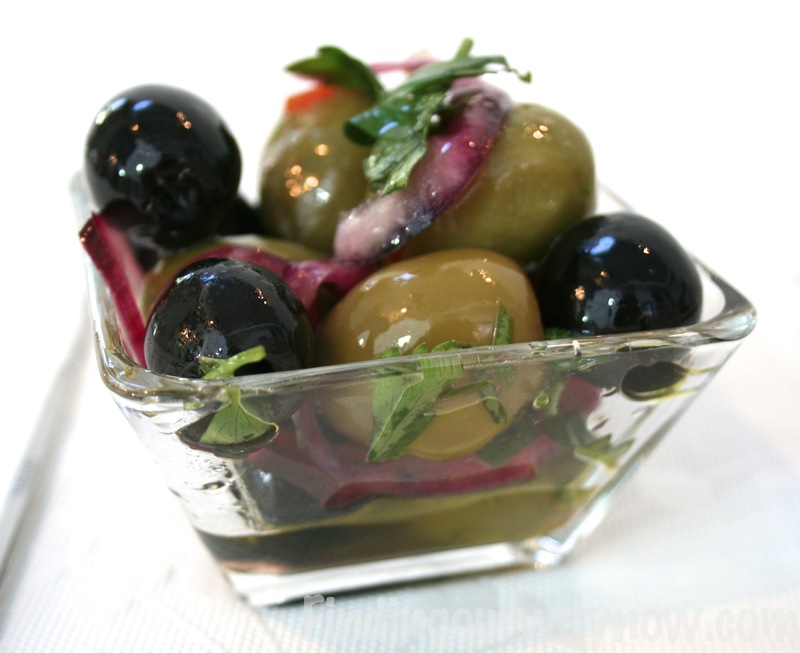 Bring the olives to room temperature and drain before serving. Notes: If you can’t find the unstuffed green olives, just leave them stuffed, or you can remove the pimentos. A good Olive oil make a big difference so don’t skimp on this. You can use any type of vinegar you desire. I like the clean taste of the cider vinegar with this recipe. 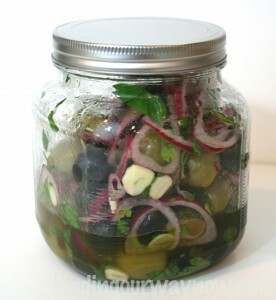 For a bit of fun, mix it up with a larger variety of olives. Yep, it’s that easy, and they taste pretty darn good. I’ll often throw them together to have on hand for unexpected guests, a spontaneous picnic, potluck or family gatherings. They can also make a great hostess gift when you’re in a pinch. Just pack them in a pretty jar with a bit of raffia, a label and voilà. Regardless of how you use them, make a double batch because they’ll go really fast. Enjoy. If you enjoyed these “Garlic Olives For A Busy Cook,” check out my Warm Marinated Feta Cheese with Olives, Crunchy Garbanzo Beans, and these Easy Meatballs.